Antioch, IL – August 26, 2014 – The prestigious 2014 Chicago Hunter Derby at Annali-Brookwood Farm, held September 5-7, 2014, is one of the most elaborate events of its kind, hosting top riders and horses from around the country and benefitting local charities in the process. The event is presented by Chicago Equestrians for a Cause, a non-profit organization producing high-level equestrian events and raising funds for local charities. This year's charities include Ann & Robert H. Lurie Children’s Hospital of Chicago, The United States Hunter Jumper Association Foundation and the University of Chicago Cancer Research Foundation. 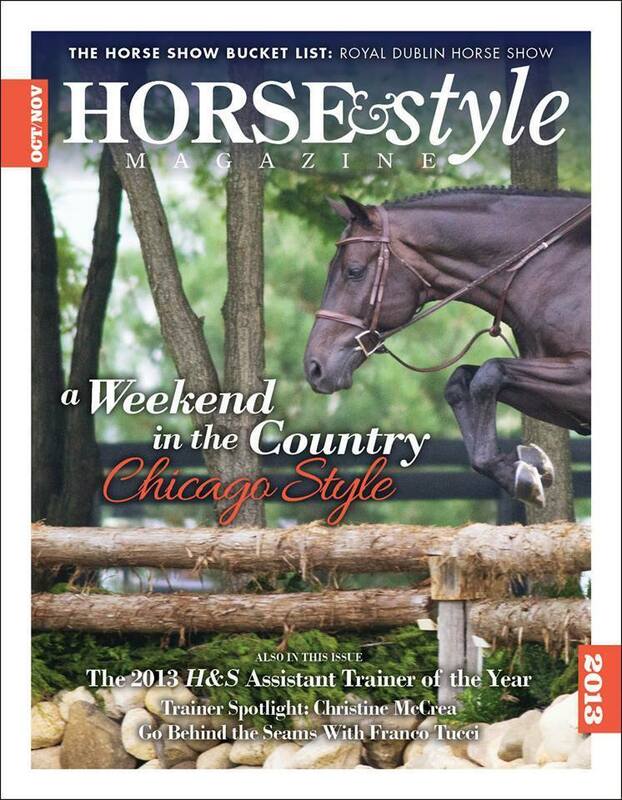 The Chicago Hunter Derby is proud to announce it's media partnership with Horse & Style Magazine for 2014. "Horse & Style is thrilled to partner with the Chicago Hunter Derby, an event that showcases the true elements of the hunter discipline that so often fall by the wayside in today’s world. The Chicago Hunter Derby creates a stand alone event that represents the classic elements of hunters that Horse & Style is proud to stand behind,” said Erin Gilmore, editor of Horse and Style (H&S). The H&S team travels the world to cover horse shows and events, riders and trainers, and equestrian style and fashion. The magazine was created to bring equestrian style and the horse world together with a unique focus on horses and fashion. Horse & Style will feature article on the Chicago Hunter Derby in their October/November issue. Horse & Style joins media partners Phelps Media Group International andChicagoEquestrian.com. Besides the renowned derby itself, the event hosts a tent full of horse enthusiasts who come to support the event and the charities. WGN's Dina Bair will be the emcee inside the tent for Sunday's big day. The event offers the complete derby atmosphere for both spectators and riders. Spectators can enjoy shopping, delicious food, fantastic beverages, children’s activities sponsored by Rice Dairy and the Children’s Horseless Horse Show. 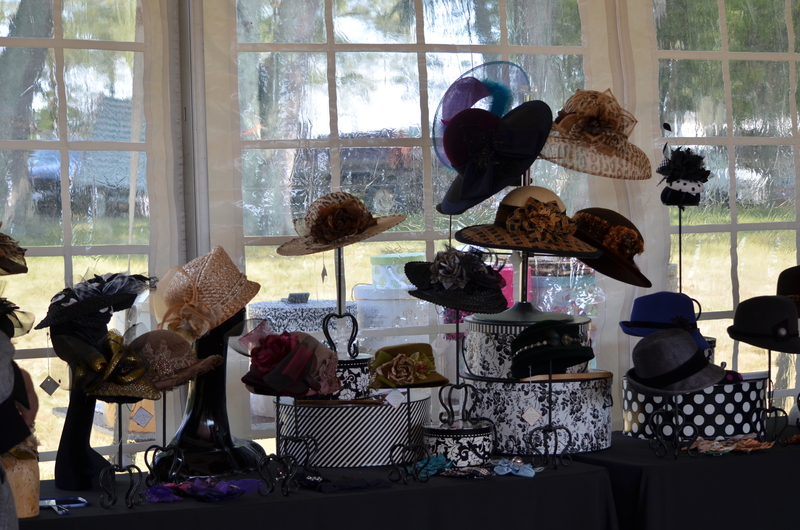 Stylish shopping opportunities include vendors with the latest in equestrian fashion and design. Some vendors are offering special donations to the charities for every purchase so please shop away! Mountain Hides is one of those vendors offering a charity special. 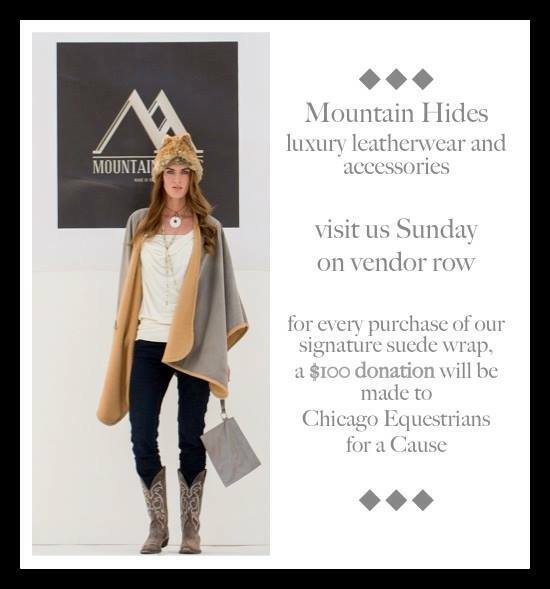 They will be donating $100 to Chicago Equestrians for a Cause for every purchase of their signature suede wraps. The company is a luxury leatherwear and accessory line founded by Jodi Henderson & Laura Schoch, two local stylists. Barrington Saddlery will be returning to vendor row this year. Barrington Saddlery carries such lines as Le Fash, who will be sponsoring the "Wear It & Win It" challenge and the Ride in Style Award at this year's Derby. If the winner of the National Derby is wearing any Le Fash products, including their show shirts and City Breech™, Le Fash will donate $500 to Chicago Equestrians for a Cause. Shop online at www.lefashny.com or with Barrington Saddlery to get your Le Fash for the derby class! For the Ride in Style Award, Le Fash will award a $500 gift certificate to the Best Turned Out Horse & Rider pair from Saturday's competition. Arianna Vastino, owner of Le Fash, will announce and present the winner on Saturday night's "Derby After Dark" party. Extra points toward the Style Award will be added to riders for wearing Le Fash products. J. McLaughlin, founded 35 years ago, is a fashion house with a take on classic American sportswear and accessories and will have great products for you to check out. Also on hand for shopping will be Liza Hennessey, an American collection of fine leather goods designed and manufactured in New England. Distinguished publications including Town & Country Magazine, Boston Common Magazine, DownEast Magazine and Equestrian Culture Magazine have all featured Liza Hennessey products. La Mundial will also be returning to vendor row this year. 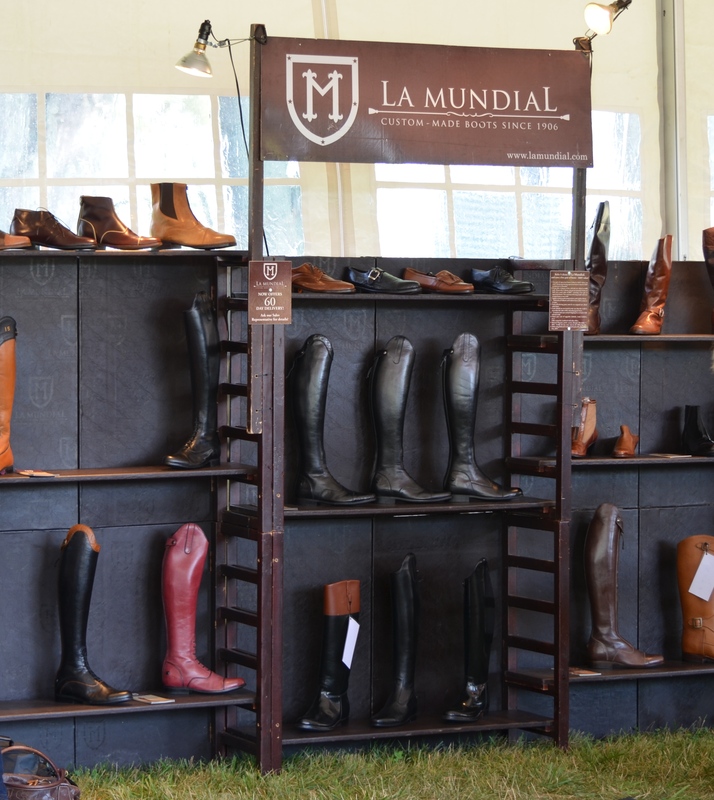 Made in Ecuador since 1906, La Mundial creates custom leather footwear and riding boots. Saddle shopping? CWD & Devoucoux, makers of fine saddles and leather tack. will be on hand for you to see their newest designs and answer your saddle fitting questions. B+ is a delicate jewelry line that promotes a positive message. The husband of one of the partners survived leukemia through stem cell transplant, which turned his blood type from A+ to B+; hence their name, Be Positive. Tickets can be purchased at www.ChicagoEquestriansforaCause.com for Sunday’s final round of the $50,000 International Hunter Derby, sponsored by Canadian Pacific. Friday and Saturday events are open to the public for a suggested donation of $25 at the door. Friday, September 5th, features the $7,500 International Derby Welcome Stake at 10:30 am and the National Derby Welcome Stake at 1:30 pm. Lane Change Farm and Kensel, LLC sponsor both events. Saturday, September 6th, features the $5,000 USHJA National Hunter Derby sponsored by Sapphire Riding Academy at 10:00 am. Lunch will be served at noon, with the $50,000 USHJA International Hunter Derby sponsored by Canadian Pacific at 2:30 pm. The fantastic Derby After Dark Party follows the conclusion of the day’s competition. For a schedule of events & to purchase tickets, please visit the website atwww.ChicagoEquestriansforacause.com. Features the $50,000 USHJA International Hunter Derby and the $5,000 USHJA National Hunter Derby. New in 2014, the $7,500 International Hunter Derby Welcome Stake and the $2,500 National Hunter Derby Welcome Stake.